The pair of near-colliding galaxies NGC 2207 and IC 2163. Cover photograph from “Laboratory Experiments in Physics for Modern Astronomy” (Springer Business+Media). The Center for Computational Astrophysics (CCA) is a research organization in Oak Park, Illinois, whose staff performs research into current areas of astronomy and applications of probability, statistics, and Monte Carlo simulations into other areas of inquiry. With a staff of retired professors from the Chicago area, CCA is the home base for the Near Earth Asteroid Reconnaissance Project, a world-wide network of amateur astronomers and small observatories involved in the discovery and determination of the orbits of near-earth asteroids, or more generally near-earth objects, with possible earth-crossing orbits. Its staff also authors textbooks in astronomy and popularizes issues in astronomy with the media. 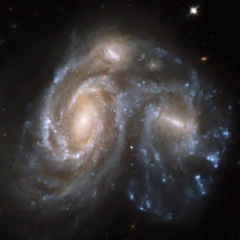 CCA was founded in 1997 by its current director, astronomer Dr. Les Golden, a retired astronomy and physics professor at the University of Illinois at Chicago. CCA coordinates the efforts of a world-wide network of volunteers and performs data reduction and orbital position determination for near-earth objects discovered by the Near Earth Asteroid Reconnaissance Project. Its associates have published papers in game theory, internet traffic,, and random number generators. This page was last modified on 19 December 2011, at 22:37.